Just a reminder that I (alongside a long list of fabulous YA authors!) 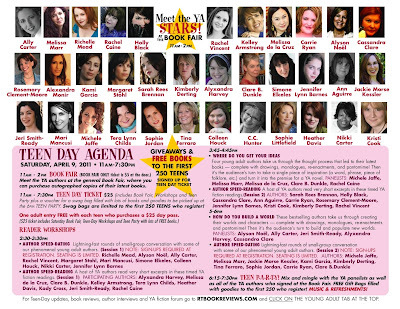 will be signing books, taking part on panels, and speed dating with the readers on Saturday, April 9, 2011, at the Bonaventure Hotel in Los Angeles, CA as part of the RT convention Teen Day--and I really hope to see you there!! 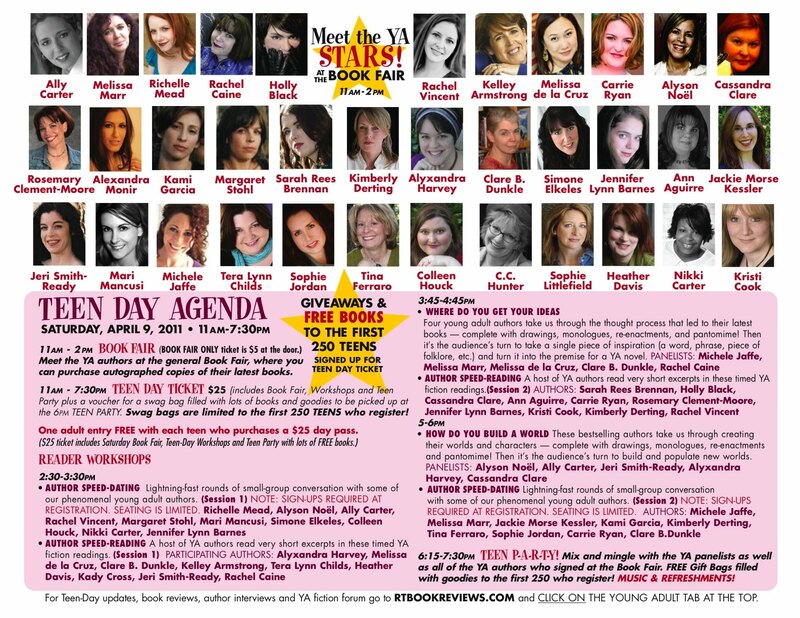 Where else can you chat with Melissa De la Cruz, Ally Carter, Cassandra Clare, Richelle Mead, and more--all under one roof??! Oh, and aside from the signing, panels, speed dating, speed reading, etc, there will be a party at the end of the day to cap off the festivities where you can hang with your favorite authors and score swag bags, giveaways, music refreshments, and more! The signing will take place from 11:00 AM - 2:00 PM and costs $5- at the door. And the first 250 teens to register for the full day of Teen Day will walk away with a gift bag that is chock-full of all kinds of awesomeness!! To learn more and register, click HERE! To see the full list of authors, click HERE! It's going to be a blast--hope to see you there!! Summit Entertainment has optioned the dramatic rights for all 10 books in both The Immortals & The Riley Bloom series!! You can see the story HERE! Going to enjoy a celebratory breakfast, then get back to work! 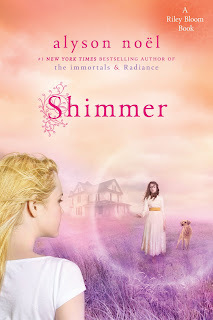 Win a Signed Copy of SHIMMER!!! Just wanted you to know that there are 5 signed copies up for grabs this week on Free book Friday Teens!! Click HERE for your chance to win!! 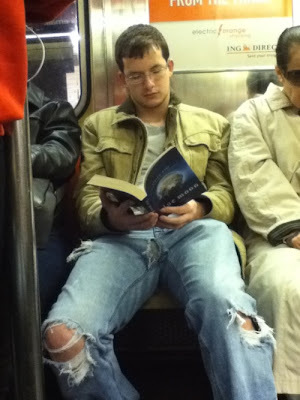 This was just sent to me-- as seen on NYC Subway Guys -- yeah, he's hot, but look what he's READING!!!! So I just got the awesome news, that SHIMMER, book 2 in the Riley Bloom series, has hit the New York Times Bestsellers list, and I just wanted to say THANK YOU for all of your support!! Riley is one of my absolute favorite characters to write, and your support of her really means the world to me--I couldn't do it without you!! Below is a short piece that was filmed at last week's SHIMMER signing at Kepler's Books in Menlo Park, CA that I thought I would share--but first, THANK YOU THANK YOU THANK YOU--again and again--you guys ROCK!! The video below was sent to me from fellow YA author, Teri Brown. It's a beautiful & powerful film, written, directed, and produced by seventeen-year old, Nicolas Braccioforte. It's message is very important and I urge you to watch it. SHIMMER poll- signings - & more! 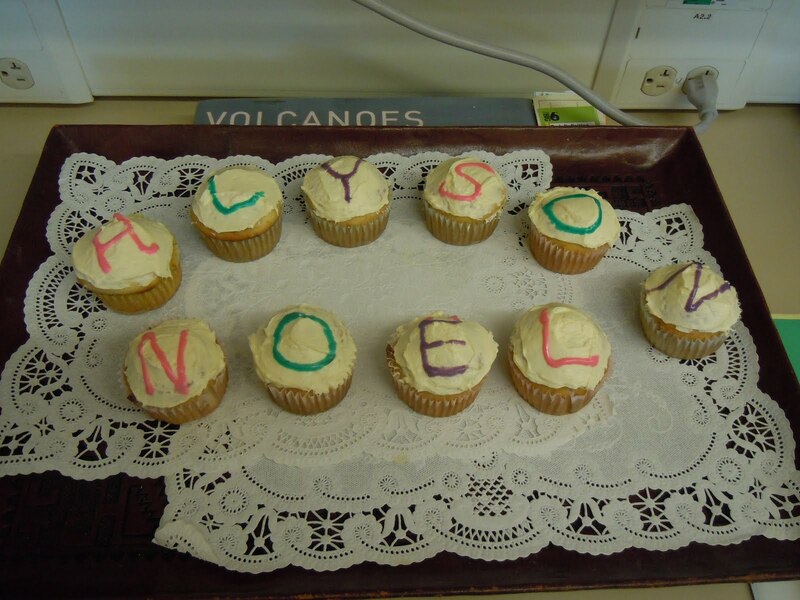 Cupcakes baked by the Terman School librarian! 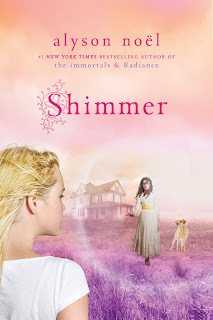 Just wanted to let you know about a fun SHIMMER poll over on Girl's Life--Click HERE to choose what you'd do if you encountered a ghost! Also, thanks to the wonderful students and staff at both the Madison & Terman middle schools--I had so much fun talking with all of you! For those of you who missed the signings at Barnes & Noble, Oceanside & Kepler's, Menlo Park--I left behind signed copies of the both The Immortals & Riley Bloom series, so feel free to stop by or call to pick up a copy! More events coming up in April--hope to see you there! 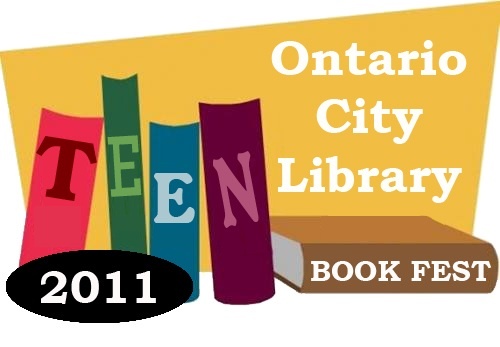 11:15 - 12:15—Panel: "Not Another Teen Panel: YA for Adults"
Saturday, April 9, Teen Day! 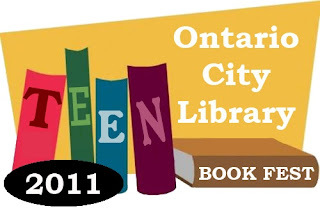 For More info on Teen Day, click HERE! For more info on the Convention click HERE! LA Times Festival of Books! Just wanted to send a big, glittery thanks to the librarians, teachers, and students at the Madison Middle School for making yesterday's school visit so fun!! Also thanks to all of you who came to list night's signing at the B&N in Oceanside--it was a great way to celebrate SHIMMER's release!! Today I'm hopping on a plane and heading north, in preparation for tomorrow night's signing at Kepler's in Menlo Park!! Today is the official release day for SHIMMER, and I couldn't be more excited! SHIMMER is the second book in the Riley Bloom series (DREAMLAND, book 3, will be in stores on 09.13.11! 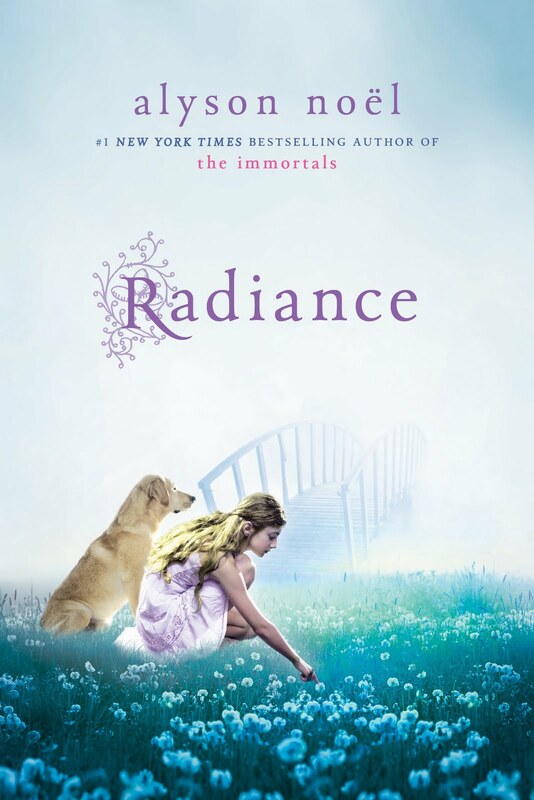 ), where Riley, Buttercup, and Bodhi are enjoying a well-deserved vacation on St. John, Virgin Island, when Riley comes across a young ghost named Rebecca, and soon learns Rebecca's not at all what she sees. The daughter of a former plantation owner, she is furious about being murdered during a slave revolt in 1733. Mired in her own anger, Rebecca is keeping the ghosts who died along with her trapped in their worst memories, and it's up to Riley to help Rebecca without losing herself to her own nightmarish memories . . .
Just like the first book in the series, RADIANCE-- SHIMMER was a blast to write! Riley is one of my favorite characters to spend time with as she's so spunky and sassy, but also has a really soft vulnerability about her as well--she's a bundle of contradictions, for sure! I'll be celebrating SHIMMER's release with a two signings this week, and I really hope to see you at one of the stops! Check out the SHIMMER Q&A, read an excerpt, and listen to an audio clip HERE! You can also listen to Riley's playlist HERE and keep up on all of my releases and news by downloading the free Alyson Noel app HERE! As always, thank you so much for your generosity, kindness, and support! It's so awesome to have such a great group of readers to celebrate with, and I couldn't do it without you! That man has made himself a big bowl of Ooblek--which, for those of you who missed that day in science class or summer camp--or, skipped that particular Dr. Seuss book where it found its fame, you can learn more about it and get the recipe to make your own bowl of Ooblek HERE. So why should you even bother with making Ooblek, thinking about Ooblek, reading any further about Ooblek, much less clicking that link?? Because Ooblek is not only fascinating and fun, but it provides a really important life lesson as well. One that twelve-year-old Soul Catcher, Riley Bloom, is forced to confront during the course of her latest, tropical island, Soul Catching, adventure in SHIMMER (in stores 03.15.11!)! You see, Ooblek is both soft and liquidy, which would seem as though you should be able to make a fist and pound your way through it, right? But Ooblek, like life, will not be forced. If you try to pound your way through it, you won't make a dent, your fist will not only not penetrate, but will actually bounce back! But if you soften your fingers and tread gently, your hand will easily find its way through, all the way to your final destination--er, the bottom of the bowl. So go ahead, make yourself some Ooblek and try it for yourself! And for added fun, add a little food coloring to really jazz it up! And speaking of SHIMMER/Ooblek . . . Note: A special thanks to my husband who not only prepared the Ooblek but who also braved the Ooblek so that I could act as photographer. No hands were damaged in this experiment. Just wanted to share this video of BLUE MOON aka ESPEJISMOS on the Chilean news!! 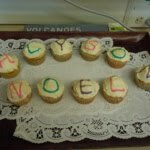 I'm blogging over at the Teen Fiction Cafe today about my recent visit to the Georgia O'Keefe Museum! Click HERE to read it and tell me about the art/artists that inspire you! I just learned that DARK FLAME is nominated for TRR's "Best YA Romance of 2010 Award"- !!!! I'd been to NM several times in the past, but always as a quick weekend visit--this was the first time I spent an entire week taking pictures, taking notes, talking to interesting people, soaking in hot springs, and, of course, eating!!! (The blue corn pancakes above were a definite fave!). And since I was there to do research for my upcoming SOUL SEEKERS series, I was thrilled to get the chance to interview several locals who provided a ton of insight that I couldn't have gotten otherwise--so a big THANK YOU to Emily, Daniel, and those who prefer not to be mentioned by name--you know who you are!! But, of course, while I was gone, tons of stuff came in, and since I had limited Internet access, this is the first chance I've had to post them--so without further ado, here goes! First off, the sweet, talented, and crazy stylish Melissa Walker posted my thoughts on the EVERLASTING cover, which you can read HERE! Also, as NIGHT STAR was just released in the UK - (have you seen the commercials? For my UK readers they're playing on E4 TV )-- I did a piece for Amazon UK on my thoughts on finishing the series, which you can read HERE! (Note: you may have to scroll down a bit since it originally posted several days ago!). Also for UK readers, there's an awesome giveaway going on over at My Kinda Book, click HERE for your chance to win! And to keep up on all of my UK releases, you can friend the UK Facebook page HERE! (PS- You can watch the commercial on FB too!). And, I have to say that as someone who was once told by one of my OC high school teachers that I'd "never amount to anything"-- it was pretty cool to be chosen as OC Metro magazines "20 Women to Watch for 2011" which you can see HERE! And last, but most definitely not least . . . I just learned that EVERMORE is nominated for Colorado's Blue Spruce Young Adult Award!! To see the full list of nominees click HERE! And . . . I've got some incredibly exciting news to announce . . . just waiting for the final OK so stay tuned for that!! But meanwhile, SHIMMER is releasing next Tuesday, March 15--and I really hope to see you at one of the signings, which you can find HERE! Okay, I think that covers it . . . now back to my post-vacation Laundrypalooza!!! Have a good night, all!